The Hungarian Liszt Ferenc Chamber Orchestra was founded in 1963 by former students of the Franz Liszt Music Academy in Budapest. 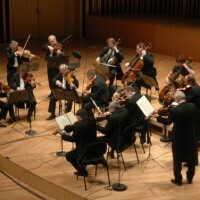 During this nearly half of a century, the orchestra have built up an exceptional international reputation which has been underlined by concerts in more than fifty countries, including the Carnegie Hall in New York, the Sydney Opera House, and the Théâtre de la Ville in Paris. Their repertory spans almost the entire history of music from Bach, Mozart to the romantics and to 20th century composers. The Orchestra regularly performs with young Hungarian composers and gives concerts at universities and elementary schools. The outstanding work of the Liszt Ferenc Chamber Orchestra has been rewarded by numerous prizes.